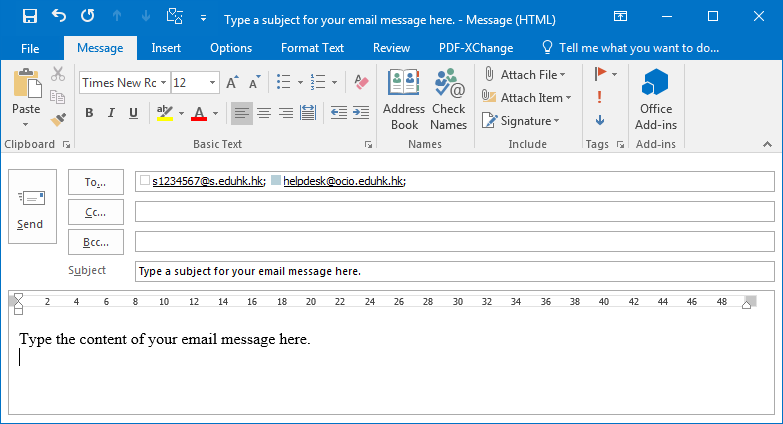 The Institute uses Microsoft Outlook as the major email and messaging environment. 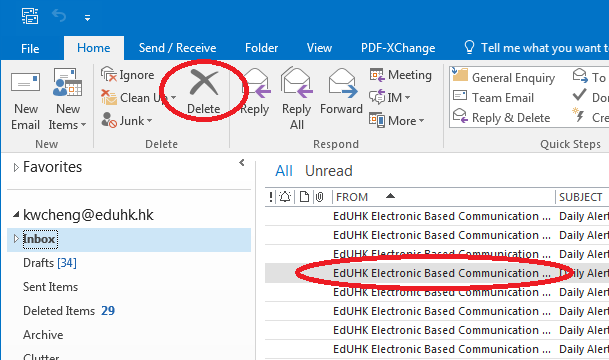 This document focuses on the basic operations but also describes some advanced features of Outlook. 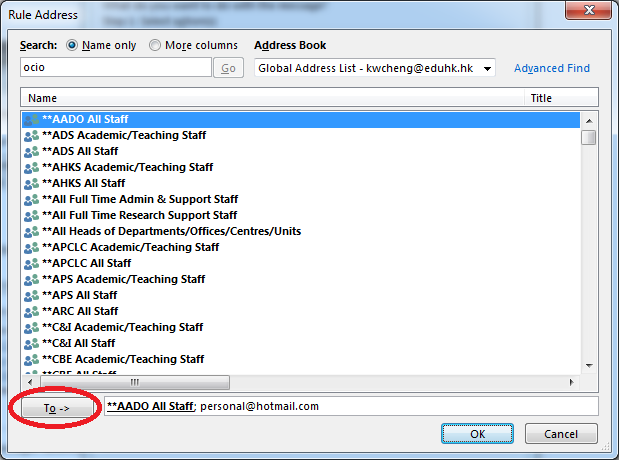 For details on how to set up user profile to work with our email servers, please refer to Microsoft Outlook Profile. 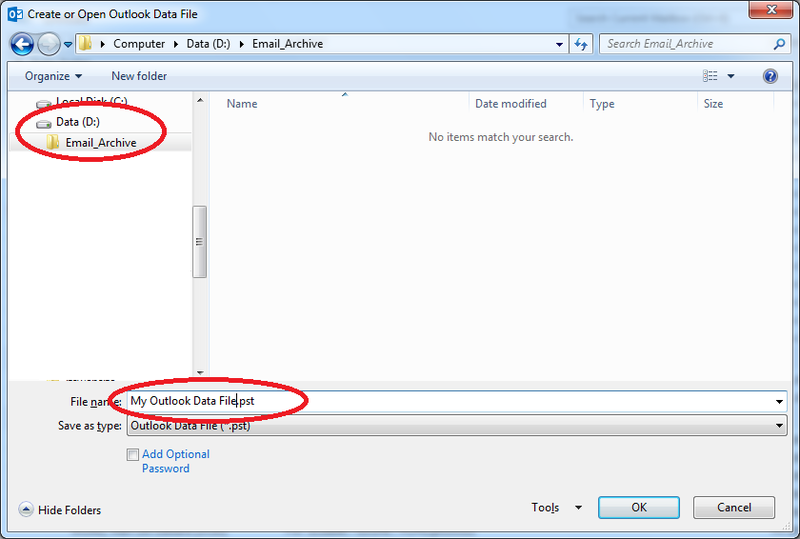 Start Outlook and login with your email account username and password. Select New Email from the ribbon bar's "Home" tab. Type recipients' email addresses at the To... field. You can also click the To... button to select recipients from the Address Book. For more than one recipient, use semi-colons ';' to separate their email addresses. Enter the subject and the message body. If needed, you may attach document to your email. To do so, click Attach File from the "Message" tab and select the file(s) you need. Finally, click the Send button to send off the message. Note: When your email has been sent successfully, a copy will be stored at the Sent Items folder. You need to regularly delete unwanted emails in this folders (and other folders as well) to keep your mailbox small and clean. Click the Delete icon from the "Home" tab and the message will be moved temporarily to the Deleted Items folder. To remove the messages PERMANENTLY, highlight the "Deleted Items" folder from the left panel. Then click Empty Folder from the "Folder" tab. Click Yes when prompted to confirm the deletion. By doing that, all messages in the Deleted Items folder will be permanently removed and cannot be recovered. When you delete a message, it will be placed in this folder. It will only be permanently removed when emptying the "Deleted Items" Folder. Copies of messages that you sent are stored in this folder. To clean up messages from any of the above folders, first select the folder to view its content. Use the method mentioned in the previous section Deleting Messages to delete the items in the folder. 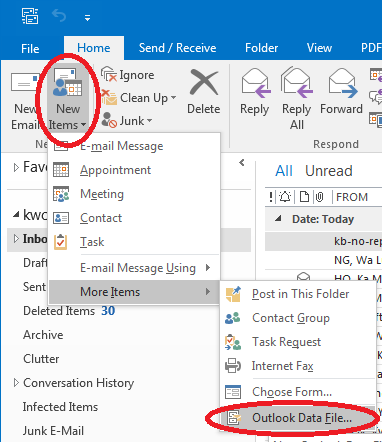 In Outlook, select New Items -> More Items -> Outlook Data File from the "Home" tab. Make sure Personal Folders File (.pst) is selected and click OK. 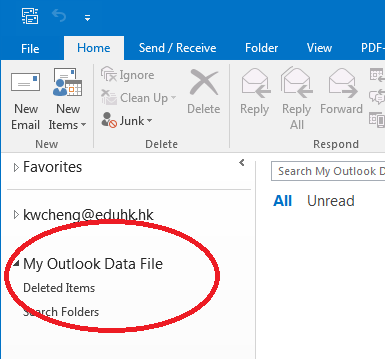 Select the storage location (e.g., D:\Email_Archive) and enter the file name (e.g., "My Outlook Data File.pst") of the personal folder. 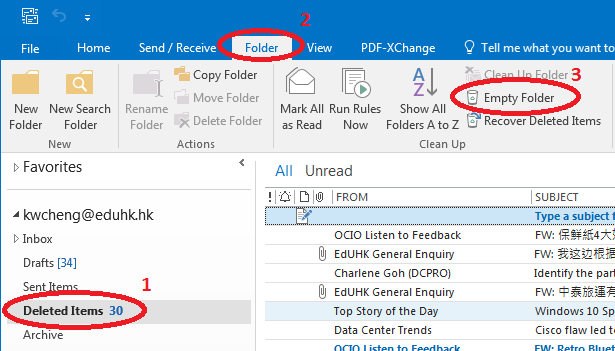 A personal folder will be added to the folder list (the file name will be used as the display name in Outlook), and you can either move your emails or copy them to the personal folder. 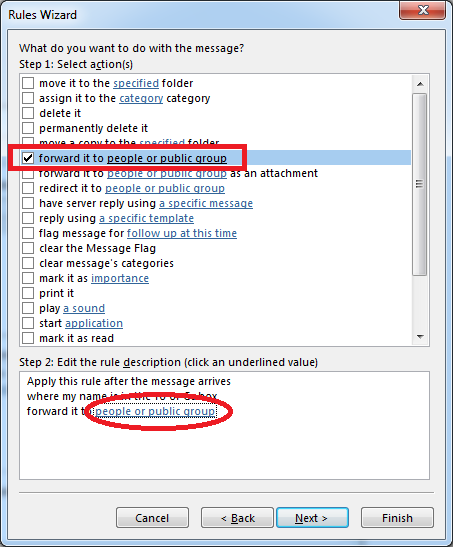 If you choose to move the emails to the personal folder, it will free quota space in the server. Note that the emails in the personal folder are stored in the storage location specified above. 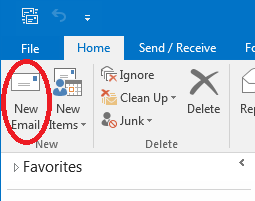 In Outlook, choose File from the ribbon bar. Select Rules and Alerts on the right hand side. 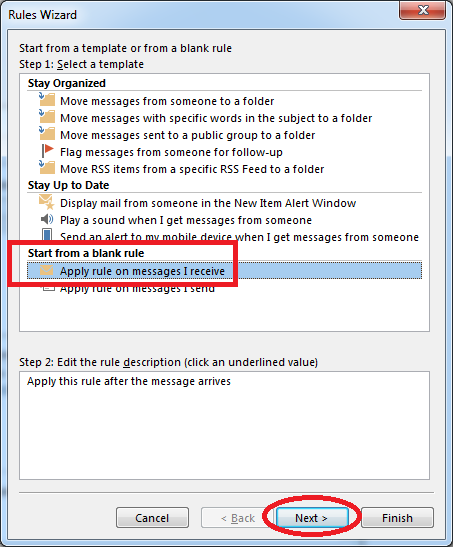 Select Apply rule on messages I receive under the "Start from a blank rule session. And click Next to continue. 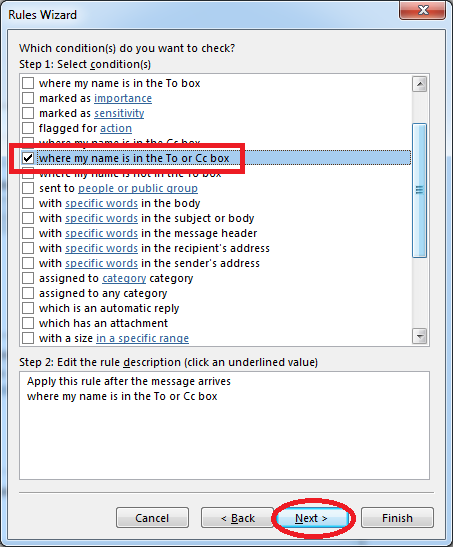 Tick where my name is in the To or Cc box and click Next. Click on people or public group in the lower panel. Select the required address in the "Rule Address" window. If the required address is an Internet address, you can enter the full email address in the box directly. Click OK in the Rule Address window to proceed. 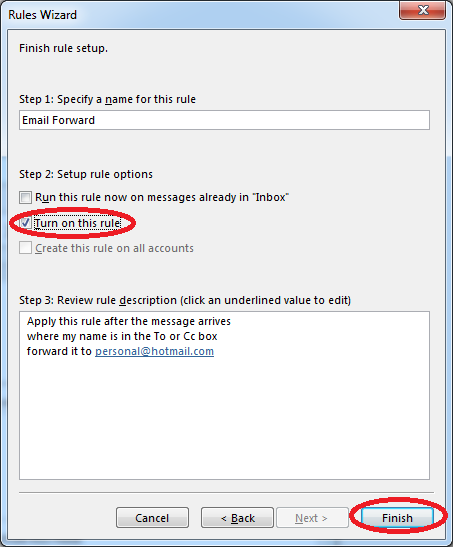 Click Next twice and then give a name for the rule (e.g., Email Forward). Make sure Turn on this rule is checked, then click Finish. Finally, click OK. Whenever necessary, you may uncheck the corresponding box to turn off the rule. OCIO has subscribed the "IronPort anti-spam services", based on Cisco’s IronPort technology, is to provide spam filtering functions for all staff members and staff related email accounts on Office 365. Incoming emails from the Internet will first go through the IronPort system, and based on its own algorithm IronPort will determine if a mail is likely to be a spam. Suspected spam will be stored in the system and a digest of the suspected spam will be sent to the users by email on a daily basis; whereas 'good' mails will be sent to user's mailbox as usual. If needed, users can "release" any of the filtered messages to their mailboxes through the notification email. For details, please visit IronPort Anti-Spam Services. 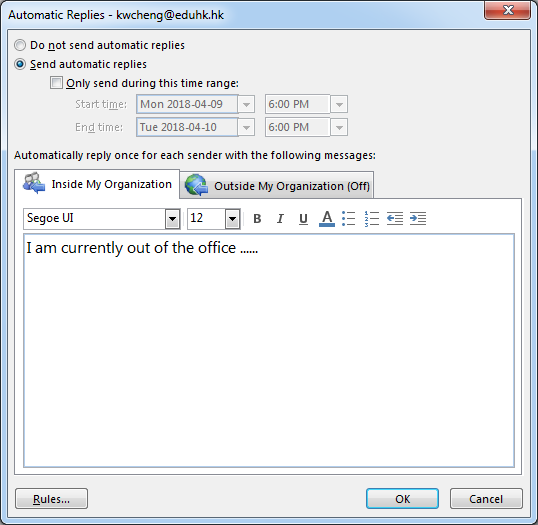 Select Automatic Replies (Out of Office) on the right hand side. Select Send automatic replies. Then enter the automatic reply message in the text box provided. If needed, you may also set the time range for the replies. Note: When you are back to the office, select Do not send automatic replies to turn it off.